Saint Sava the Sanctified was born in the fifth century at Cappadocia of pious Christian parents, John and Sophia. His father was a military commander. Journeying to Alexandria on military matters, his wife went with him, but they left their five-year-old son in the care of an uncle. When the boy reached eight years of age, he entered the monastery of Saint Flavian located nearby. The gifted child quickly learned to read and became an expert on the Holy Scriptures. In vain did his parents urge Saint Sava to return to the world and enter into marriage. When he was seventeen years old he received monastic tonsure, and attained such perfection in fasting and prayer that he was given the gift of wonderworking. After spending ten years at the monastery of Saint Flavian, he went to Jerusalem, and from there to the monastery of Saint Euthymius the Great (January 20). But Saint Euthymius sent Saint Sava to Abba Theoctistus, the head of a nearby monastery with a strict cenobitic rule. Saint Sava lived in obedience at this monastery until the age of thirty. After the death of the Elder Theoctistus, his successor blessed Saint Sava to seclude himself in a cave. On Saturdays, however, he left his hermitage and came to the monastery, where he participated in divine services and ate with the brethren. After a certain time Saint Sava received permission not to leave his hermitage at all, and he struggled in the cave for five years. Saint Euthymius attentively directed the life of the young monk, and seeing his spiritual maturity, he began to take him to the Rouba wilderness with him. They set out on January 14, and remained there until Palm Sunday. Saint Euthymius called Saint Sava a child-elder, and encouraged him to grow in the monastic virtues. 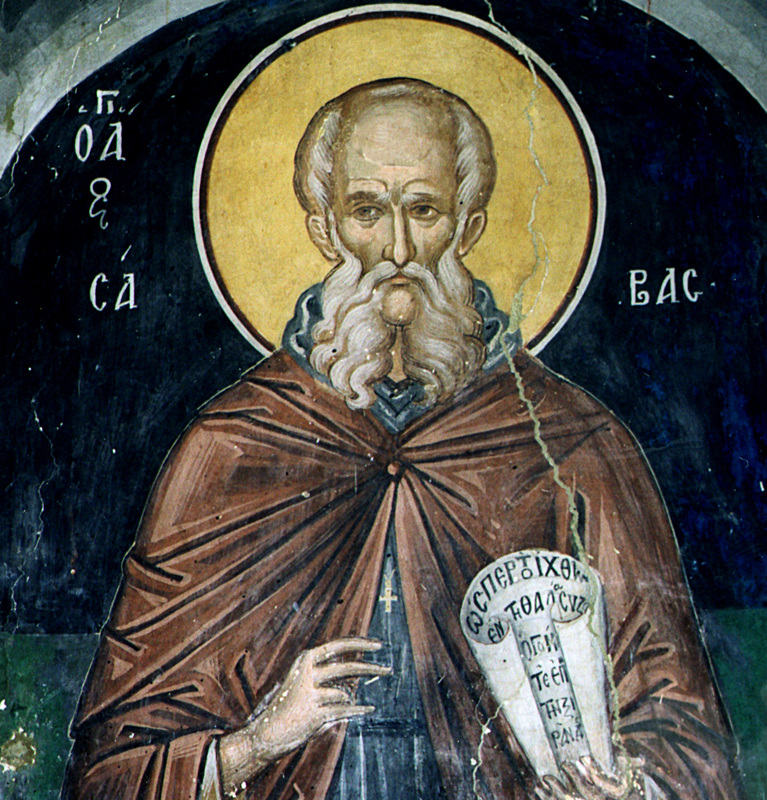 When Saint Euthymius fell asleep in the Lord (+ 473), Saint Sava withdrew from the Lavra and moved to a cave near the monastery of Saint Gerasimus of Jordan (March 4). After several years, disciples began to gather around Saint Sava, seeking the monastic life. As the number of monks increased, a lavra sprang up. When a pillar of fire appeared before Saint Sava as he was walking, he found a spacious cave in the form of a church. Saint Sava founded several more monasteries. Many miracles took place through the prayers of Saint Sava: at the Lavra a spring of water welled up, during a time of drought there was abundant rain, and there were also healings of the sick and the demoniacs. Saint Sava composed the first monastic Rule of church services, the so-called “Jerusalem Typikon”, accepted by all the Palestine monasteries. The saint surrendered his soul to God in the year 532.